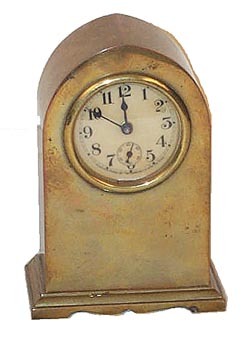 Waterbury Clock Co. novelty called the "Amon", ca 1912. Smallbrass case is 5 inches high, 2 inch celluloid dial with seconds dial. Doesntwant to run. Would be a good clock to practice on, put a little oil on thepivots, shake it good, and hope it runs. Ly-Waterbury No. 1941.